​Jimmy Dunn has served as District Attorney General for the Fourth Judicial District, which includes Sevier, Cocke, Jefferson and Grainger Counties, since being elected in 2006. Prior to being elected, Dunn served as Assistant District Attorney for more than sixteen years. He was re-elected for another eight year term in 2014. A Cocke County native, Dunn was one of eleven children of James J. and Marian Hall Dunn, growing up in Newport where he graduated from Cocke County High School in 1965. Dunn graduated from Walters State Community College and East Tennessee State University where he studied English with an interest in teaching and also majored in criminal justice. He graduated from the Federal Bureau of Investigation National Academy in Quantico, Virginia. 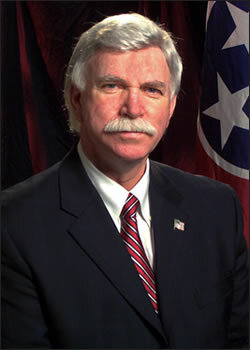 Later, while working with the Tennessee Department of Safety, he attended Nashville School of Law from 1983-1986. He was admitted to the Tennessee Bar in October 1986 and also admitted to the Federal Bar of the Middle District of Tennessee in 1986. He and his wife, Karene, have a daughter, Lauren, and a son, Bruce. Before he became an attorney, Dunn served his nation by joining the Army and serving as a military police officer in Germany from 1966-1968. He was a member of the 30th Military Police Battalion. Currently, Dunn serves on the Tennessee Public Safety Coalition which is comprised of the Tennessee Police Chiefs’ Association, the Tennessee Sheriffs’ Association, and the Tennessee District Attorney Generals’ Association. Dunn is the voting member for the District Attorneys. The Public Safety Coalition works together to improve legislation for the safety of all Tennesseans. District Attorney General Dunn has been elected to serve as a member of the Executive Committee of the Tennessee District Attorneys General Conference. As a member of the executive committee, He participates in oversights of the Conference administration, including budgeting, accounting, payroll, personnel and property management for all district attorney offices throughout the state.